With the Indian Ocean to the north and west, the Great Australian Bight and Southern Ocean to the south, the Northern Territory to the north-east, and South Australia to the south-east, Australia’s largest state does dramatic landscapes, pioneer heritage, and Outback grandeur like nowhere else. Here’s the best things to do in Western Australia - an outdoor wonderland celebrated for its stunning coastlines, buzzy city hubs, exciting marine adventures, top-notch boutique wineries, and spectacular natural attractions. 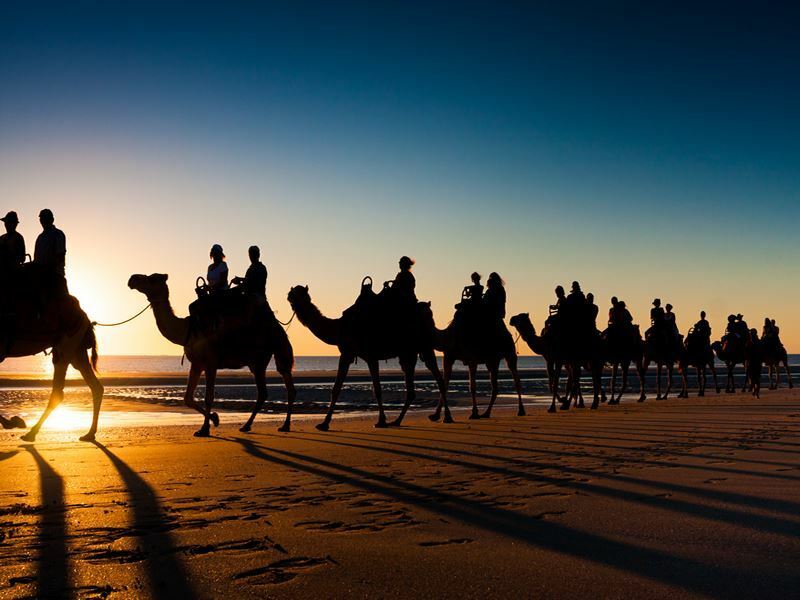 What: Camel stomping grounds don’t get more iconic than Cable Beach - Broome’s dazzling 14-mile-stretch of blinding white sands fringed by the turquoise-tinted waters of the Indian Ocean (it was named for the undersea telegraphic cable that came ashore here in 1892). While many head here to step aboard a Pearl Lugger, try their hand at fishing or kayaking, shop for precious South Sea shells, and even join the veteran naturists and nudists who gather on a section known as 'North of the Rocks', nothing beats saddling up for a one-hour sunset saunter on a friendly camel. Offered by several tour operators, including Red Sun Camels (red blankets) and Broome Camel Safaris (blue blankets), you’ll get to sit astride a gentle hump-backed giant while it walks rhythmically in time with the rest of the camel “train”. If you can’t make it for sunset, morning and pre-sunset rides along the same well-trodden path at the beach’s northern end are available. The best bit: At the southern end of Cable Beach is Gantheaume Point, a dramatic landscape named in 1801 by Nicolas Baudin to honour French navy officer Count Honoré Joseph Antoine Ganteaume. Head here for striking rust-hued rocks, glistening sands, a towering 1906 steel lighthouse, and one of the world’s most fascinating collections of 135-million-year-old dinosaur footprints (located 30 metres out to the sea, they can be seen only at low tide). What: Rising above the Swan River, the Darling Range, and Perth’s awe-inspiring cityscape, the 1,003-acre Kings Park on the 186-foot-high Mount Eliza is a mixture of grassed parkland, botanical gardens, and untamed bushland. You’ll also find picnic-worthy lawns, barbecue areas, cycling trails, children’s playgrounds, and a summertime schedule that includes under-the-stars concerts and open-air cinema screenings. Further not-to-be-missed attractions include the 750-year-old Giant Boab Tree (Gija Jumulu) that made its incredible 2,000-mile journey here from its Kimberley home in 2008, and the revamped Rio Tinto Naturescape - a unique space where kids can wade through creeks, build cubbies, climb ropes, and paddle in rock pools. 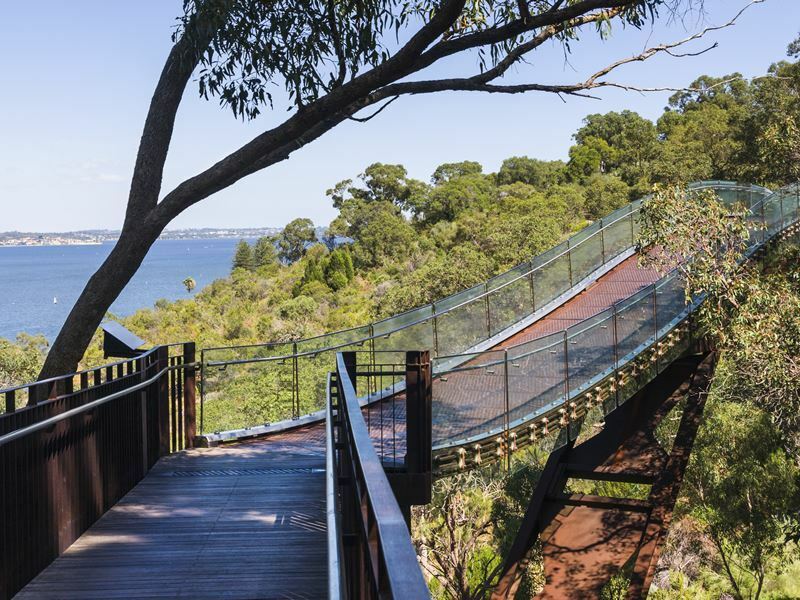 And then, of course, there’s the year-round Lotterywest Federation Walkway, a 620-metre path where the highlight is the soaring glass-and-steel suspension bridge overlooking a canopy of eucalypts. The best bit: At the park’s heart is the eye-poppingly beautiful Botanic Garden - a 17-hectare horticultural hotspot that opened in 1965 to draw focus on plant species indigenous to Western Australia. It now displays 3,000 of the state’s 12,000 species of native flora in its wonderful gardens - most excitingly the Conservation Garden that showcases 400 critically endangered and ultra-rare plants in a landscape complete with a billabong and swales. 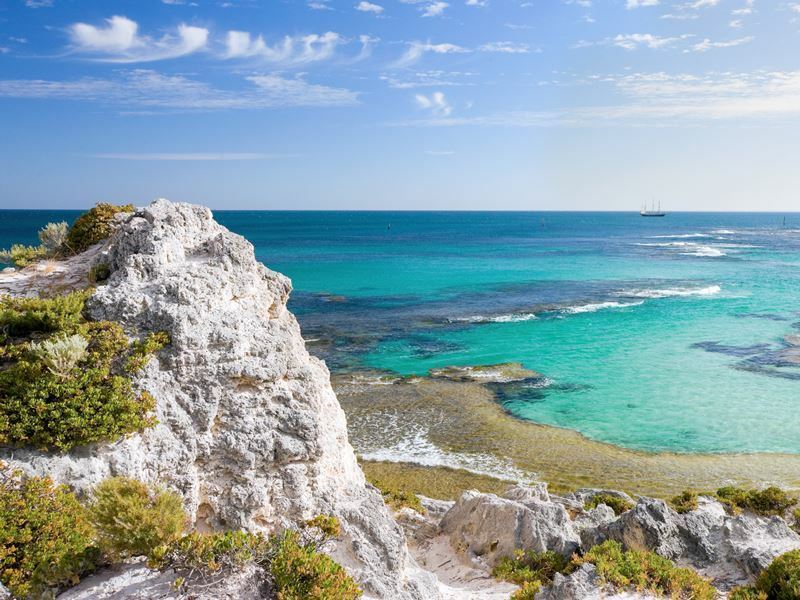 What: Given its 7,450 miles of coastline, it’s no wonder Western Australia has more ravishing beaches than any other state or territory in Australia. But of all these white-sand stunners, it’s Lucky Bay that claims to be the very whitest (this has been scientifically proven after rigorous testing by members of a national soil and terrain committee). 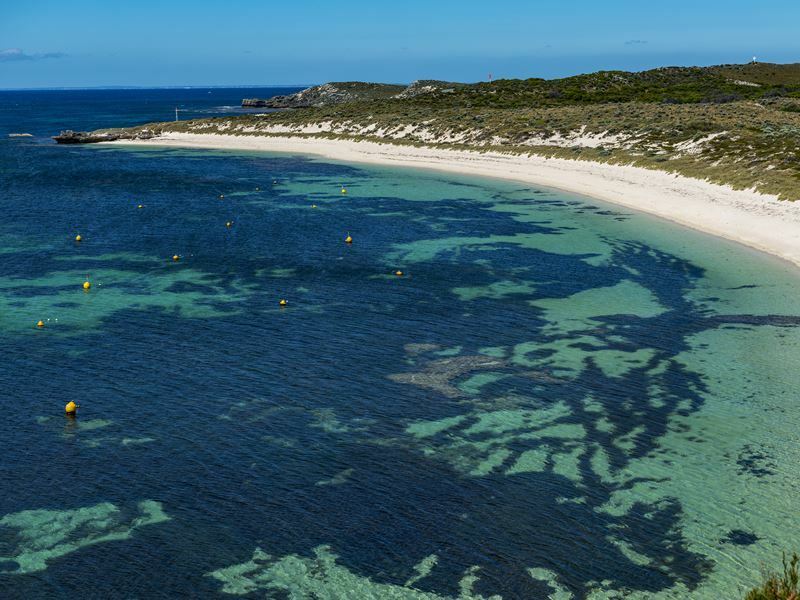 Easily the most swoon-worthy spot in a string of beaches along the coast of Cape Le Grand National Park and Esperance, it was named by explorer Matthew Finders in 1802 when his vessel HMS Investigator took shelter here from a summer storm. Two centuries later, it still wows with snow-white powder sands, clear-as-glass turquoise waters, perfect swimming conditions, and frequent sightings of resident kangaroos. Most fabulously, the beach stretches for just over three miles, so you won’t find yourself battling crowds to stake out your own glaringly bright slice of paradise. The best bit: For those venturing beyond the sands, there’s some excellent walking trails overlooking the wildlife-rich Recherche Archipelago (you’ll see migrating whales between July and October). Equally visit-worthy is the Cape le Grand National Park for its rolling heathlands, massive granite peaks rising from coastal plains, and first-come-first-served caravan and campgrounds with solar-heated showers, toilets, gas barbecues, and picnic tables. What: As one of the state’s most cherished best places to eat, drink, and be very merry (mainly on chardonnay, cabernet, and sauvignon), Western Australia’s award-winning Margaret River Wine Region is the 60-mile strip between Cape Leeuwin to the south and Cape Naturaliste to the north. Wine is taken extremely seriously here; there’s approximately 217 vineyards and 187 wineries producing just three per cent of Australia’s overall wine production (but more than 20 per cent of its premium wine). Unsurprisingly, you’ll find 100-plus private or group tour companies offering ready-made and customised itineraries that include stops at iconic and boutique vineyards big and small. 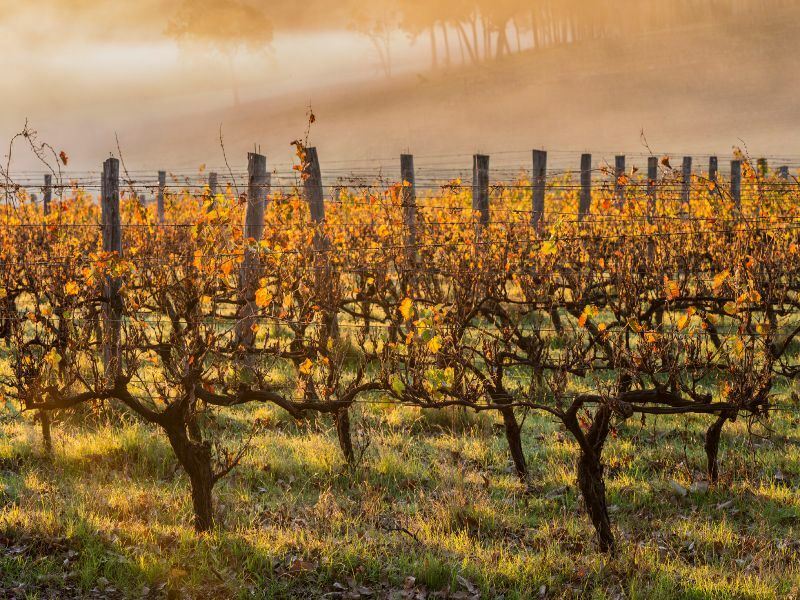 Most include a visit to the wine-rich towns of Cowaramup and Wilyabrup as well as the beautiful Margaret River township - the region’s foodie heart famed for its craft breweries, boutiques, artisan dining, and year-round cultural events. The best bit: The internationally-renowned wining and dining may get all the love, but this region is also home to dramatic cliffs, idyllic bays, tall-timber native karri forests, ancient cave systems, pristine beaches, world-class surf breaks, and amazing hiking trails. There’s also a slight bohemian fringe to the place, not least for the artist studios, galleries, and outlets where locals sell their homemade cheeses, candles, soaps, chocolates, olive oils, surfboards, and more. What: The perfect day-trip for those staying in Perth and Fremantle, Rottnest Island was rather unappealingly named in 1696 when Dutch sea captain and explorer Willem de Vlamingh mistook the quokka’s for “a kind of rat as big as a common cat” and declared it a rotte nest (translating as rat’s nest). Nowadays, this car-free paradise tempts city folk with much more than hanging out with furry marsupials; from hitting deserted cycle paths and lazing by splendid ocean beaches to paddling around bays and snorkelling splendid coral reefs. You’ll also find a golf club with Ben Davey-designed courses (both 9- and 18-hole layouts), two historic lighthouses (Wadjemup and Bathurst), and plenty of seagrass meadows for fish species such as the Cobbler and Long-headed Flathead. Equally thrilling is riding the 64-seat Captain Hussey train that takes to you to the historic Oliver Hill battery (this also includes the volunteer-run Gun & Tunnels Tour). The best bit: For up-close encounters with Rottnest’s most famous resident (and the island’s only land mammal), the Quokka Walk is the Rottnest Voluntary Guides Association’s free 45-minute walking tour departing daily at 2:30pm from the Meeting Post outside the Salt Store in the Main Settlement. Not only will you have opportunity to meet the “happiest animal in the world”, but you’ll also be part of one of the country’s cutest trends - the quokka selfie. What: Located on the eastern shore of Peron Peninsula in the enormous Shark Bay World Heritage Area, Monkey Mia offers the best of all worlds: blissful beachlife, culture-rich experiences, and amazing encounters with Indo-Pacific bottlenose dolphins (this is the only place in Australia where dolphins visit daily). Most head here to swim in the hyper-saline waters of 62-mile-long Shell Beach where billions of tiny shells replace sand, visit the excellent Shark Bay World Heritage Discovery Centre in Denham to discover the region's ecological diversity, and get up-close with remarkable Stromatolites (the earth’s oldest of fossils) at the Hamelin Pool. There’s also no shortage of opportunities to connect with the incredible landscape, especially on camping safaris and cultural tours with professional guides who highlight why this ancient saltwater country was so crucial to the Nhanda and Malgana Aboriginal People. 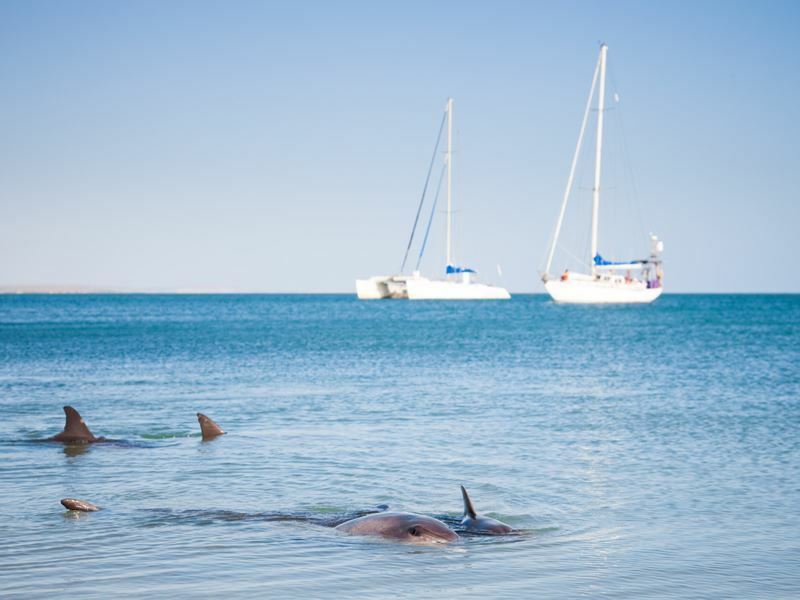 The best bit: Dolphins have been visiting the Monkey Mia Marine Reserve up to three times a day for more than 40 years (timings vary, but these rituals are more frequent in the mornings). You can expect to see between and four and seven of these smiley sea creatures at any one time and you may even be lucky enough to be chosen to feed them under ranger supervision (this privilege is granted ad hoc and never 100 per cent guaranteed). 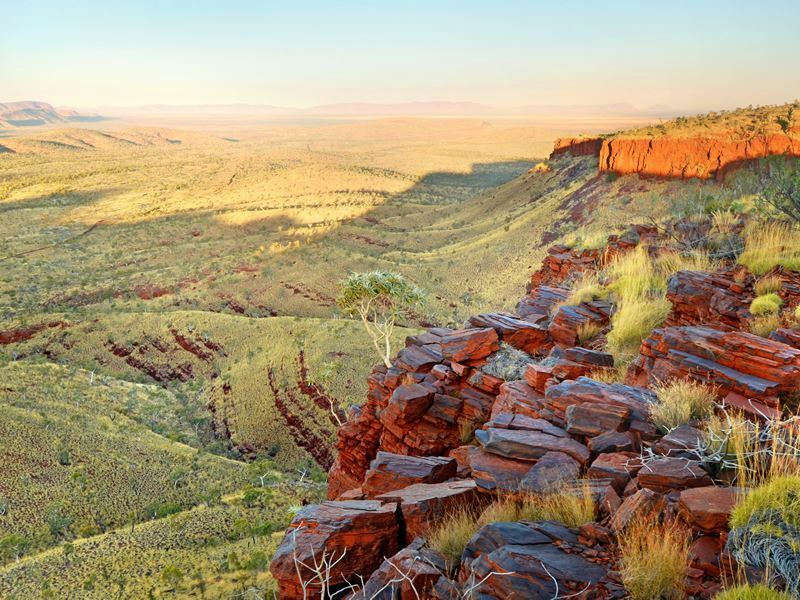 What: Originally a 1960’s stock route for droving cattle, the 410-mile-long Gibb River Road is an unsealed wilderness track running through the heart of the rugged Kimberley region. Stretching all the way from Derby to Kununurra (the town in far northern Western Australia located at the eastern extremity of the Kimberley Region), it presents one of Australia's most epic challenges for four-wheel-drive adventurers who have at least eight days to spare. On the seeing and doing front, there’s freshwater crocodiles in the Windjana Gorge National Park, bushwalking and camping at Lennard and Bell Gorges, helicopter rides over Mitchell Falls and Mitchell Plateau, and boating down Chamberlain Gorge to see towering escarpments and Wandjina rock art. Further scenic wonders await at Tunnel Creek, Diamond Gorge, Emma Gorge, Sir John Gorge, the Pentecost River, Ord River, Galvans Gorge, Manning Gorge, and Manning Falls. The best bit: Located on the Kimberley's eastern edge, the one-million-acre El Questro Wilderness Park is a former working cattle station turned unique holiday destination with accommodation ranging from luxe homesteads to no-frills bush campsites. Must-dos include gazing in wonder at the ancient gorges, majestic mountains, mud and salt-flats, and cascading waterfalls, and bathing at Zebedee Thermal Springs (open in the mornings only). What: As the best-loved attraction at the double UNESCO-listed Purnululu National Park, the Bungle Bungle Range (known colloquially as the Bungle Bungles) is the series of bizarre-looking ochre and black striped domes that serve as the finest example of cone karst sandstone on the planet. And while exploring on foot as much as possible is awesome (especially from the Kungkalanayi Lookout at sunset), nothing comes close to seeing the sheer grandeur of this unusual beehive-like massif from above. 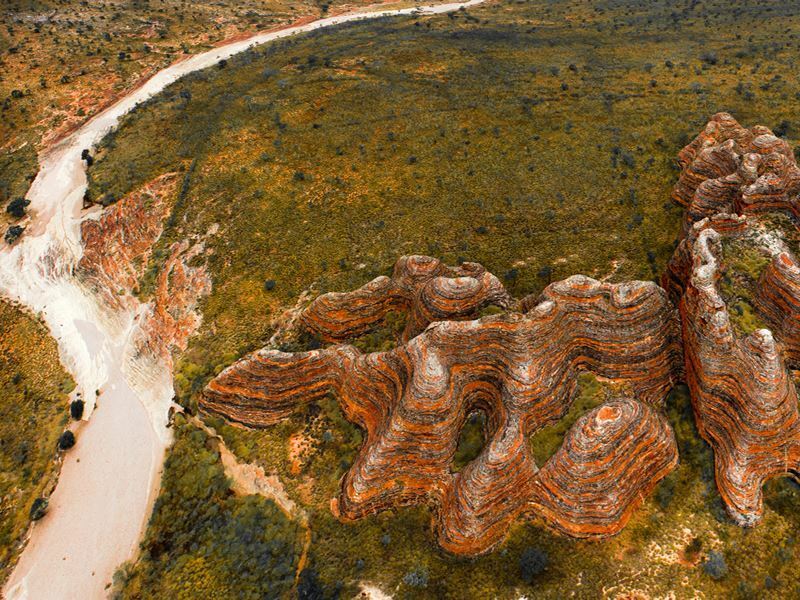 There’s a selection of helicopter flight tours departing from the Bellburn Airfield near the Piccaninny Creek day use area, the Bungle Bungles Caravan Park, Warmum Roadhouse (Turkey Creek), and Kununurra - all of which reveal areas of this jaw-dropping landscape that just aren’t accessible at ground level. Varying-length flight packages are available, including the 18-minute “Domes Special” and the 42-minute “Long Look”. The best bit: Lake Argyle, Lake Kununurra, the Ord and Bow River, the Carr Boyd and Osmand Ranges, and the Argyle Diamond Mine can all be seen from up high (all helicopters provide pilot commentary, so you won’t miss a thing). You’ll also soar over the huge Cathedral Gorge - a massive red-rock amphitheatre known for its natural beauty and acoustic brilliance (a wind quartet from the Sydney Symphony Orchestra performed an emotional set here in 2016). What: Best accessed by joining a four-wheel drive tour (the journey is an experience it itself), Western Australia’s second-largest protected area covers 627,422 hectares of the Hamersley Ranges - just north of the Tropic of Capricorn. Once you’ve entered the park, the thrills come fast and furious; from marvelling at massive mountains and escarpments, ancient geological formations, and cascading waterfalls, to scaling three of the state’s highest peaks: Mount Meharry, Mount Bruce, and Mount Frederick. 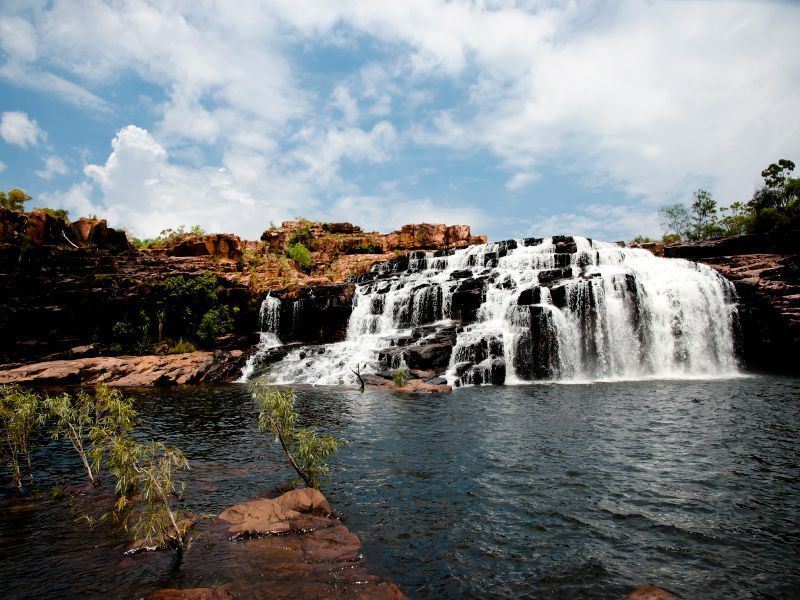 Further highlights as you journey through two billion years of the Earth's natural history include cooling off in emerald pools, paddling in crystal-clear waterways, enjoying back-to-nature luxury in an eco-retreat, and getting back to basics by camping under the Pilbara sky. And there’s plenty to please walkers and hikers too; expect a superb network of walking trails snaking through the landscape - ranging from easy to arduous. 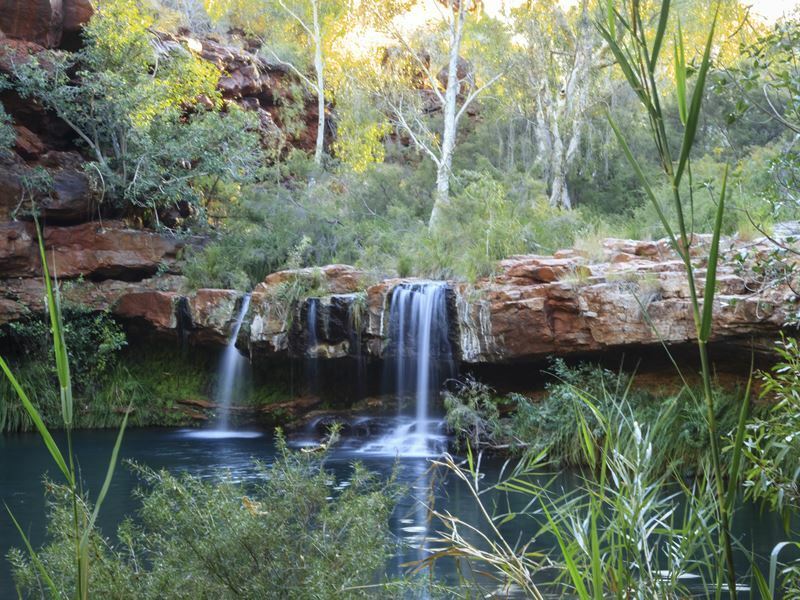 The best bit: Given that this is a semi-desert region with temperatures hitting up to 40°C, the spring-fed pools beneath Fortescue Falls (Karijini National Park’s only permanent waterfall) are perfect for a refreshing swim. If you don’t fancy getting wet, there’s also the Fortescue Fall Lookout for views down into the 100-metre deep Dales Gorge (you can see the waters crashing down the rich red rocks), as well as a relatively easy walking trail that starts at the car park. 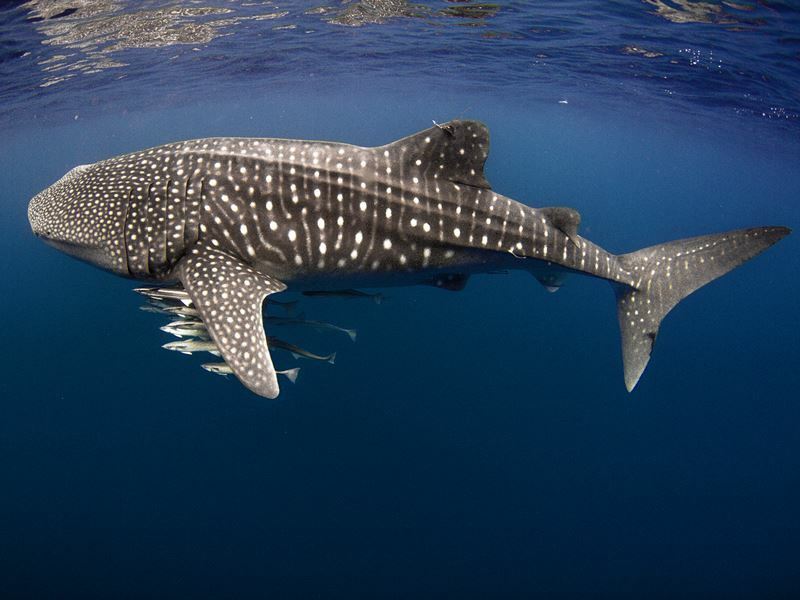 What: Comparable with Queensland’s attention-grabbing Great Barrier Reef, the UNESCO-listed Ningaloo Reef is one of the few places in the world where whale sharks regularly aggregate in large numbers. It’s also where confident swimmers are assured up-close encounters with these gentle giants between March to August (tours depart daily from Exmouth and Coral Bay). Only ten people can snorkel with a whale shark at any given time, and your boat skipper, spotter plane pilot, and guide will work in tandem to drop your swim group in the perfect position to swim along with the approaching whale shark. All operators provide full training, safety briefings, and high-quality gear such as masks, fins, snorkels, and wetsuits. Bear in mind that the tour operators are in cahoots with Mother Nature so at time there may not be a whale shark available. But if you don’t get lucky first time around, most companies will take you out again free-of-charge. The best bit: Swimming with whale sharks is the obvious highlight, but the fun doesn’t end there. Once you’ve had your fill of gliding along next to the ocean's largest fish, the journey back to shore provides many opportunities to spot some of the Ningaloo's other marine life. These include humpback whales, manta rays, dugongs, spinner dolphins, marine turtles, molluscs, and 220 species of coral. There’s also 500 species of fish include the patterned Wrasse, delicate Butterflyfish, glowing Damsel, strange-looking Flutemouths, and comical Nemo-esque Clownfish.